Ear wax, or cerumen, is produced to protect, clean and lubricate the ear canal. It keeps foreign objects from harming the inner ear, but at the same time can cause problems if too much is produced. Excessive ear wax can affect the ear drum and external auditory canal, which in turn can affect hearing, but less seriously it can also become an embarrassing condition. No one likes to feel that they are improperly groomed or somehow unhygienic. Understanding the causes of excessive ear wax, how to treat excessive ear wax and how to safely remove an ear wax plug will help you avoid or lessen the impact of this condition. Our ears are built to produce ear wax, but some people may have to deal with more ear wax than others. Excessive ear wax may be produced naturally, or some people's ears just may not clean themselves all that efficiently leading to a build-up of ear wax. 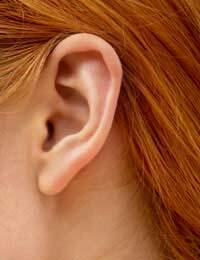 Those dealing with quite a lot of external factors affecting the ears, such as insects or dust, may also notice an increase in ear wax. Unfortunately, attempts to clean excessive ear wax may also lead to a build up as fingers and cotton buds can push ear wax deeper into the ear. The use of ear-plugs and some types of hearing aids may also contribute to ear wax build up. Treating excessive ear wax can be tricky business, not just because some ear wax is good for the ear but because many attempts to remove ear wax can actually cause greater harm to the ear. If possible, avoid inserting objects into the ear (fingers, cotton buds, pins or pressurised sprays) to try to scrape out or dislodge ear wax. Instead, spend time each day, or even twice a day, cleaning the outer ear with a soft cloth and mild cleanser to remove ear wax which has worked its way out of the ear. If you feel that you have ear wax build up which must be treated, a few drops of warmed olive oil may help to soften ear wax and allow it to more easily leave the ear. Some over the counter drops for swimmer's ear may also help flush the ear of excessive wax build up. Finally, a drop or two of hydrogen peroxide (also known as witch hazel and rubbing alcohol) can help soften and loosen excessive ear wax. After each, turn your head to the side to allow ear wax to flow from the ear onto a clean cloth and follow with a drop or two of water to more thoroughly cleanse the ear. Impacted cerumen can create health problems, not the least of which includes affecting a person's hearing. If you believe you have an ear wax plug, visit your GP to allow him or her to remove it for you. During this visit ask for advice on removing plugs yourself in the future. Your GP may be able to give you information on products or procedures for more safely dealing with your specific problem. Do not attempt to remove your first ear wax plug yourself. Excessive ear wax is an issue which can affect your health as well as your well-being. It may be embarrassing to admit to this problem, but understanding the causes of excessive ear wax, how you can treat excessive ear wax and what to do about an ear wax plug should help you deal with it safely and discreetly in the future. This writer should be banned from here and never write again. Do not ever put "hydrogen peroxide" anywhere near your ear as well as "Rubbing Alcohol" What on earth was this writer thinking about??? My god!!! "hydrogen peroxide"is a bleaching agent and used in a very much diluted form to whiten teeth. It is also used in the meat trade to whiten some meats (especially "TRIPE") If you need to get was from your ears then you can use a squirter and warm water and also you can buy the little tools to scrape out wax from your ears. I am 66 years old worked in a Chemical Factory all my life and I have used these tools since I was 20. I have never had any build up of wax in my ears and I use cotton buds to clean the canal but never push these too far in. If you do buy a tool for removing wax then buyfrom a reputable company or even your local Chemist/Pharmacy will put you right. Use them gently and you will be amazed at how much wax you can take out. When I first used them I pulled out like a small piece of rock from each ear and these have never built up again using this tool. It looks like a very small mini spoon but please use carefully should you buy one. Hydrogen is not also known as Witch Hazel and Rubbing Alcohol per your statement "hydrogen peroxide (also known as witch hazel and rubbing alcohol)".They are 3 totally different things but can sometimes be substituted for each other.You should not be giving medical advise! Um...Witch Hazel, hydrogen peroxide and rubbing alcohol are very much different...just so it has been said.I would probably avoid rubbing alcohol in the ear.